This super simple gluten free dinner recipe only uses one tray for cooking and is packed with veggie goodness. You can vary the base vegetables depending on what you have in your fridge to use up, as well as the quantity of each item. Courgettes, aubergines, sweet potato, kale and cauliflower would also work wonderfully in the base mix. 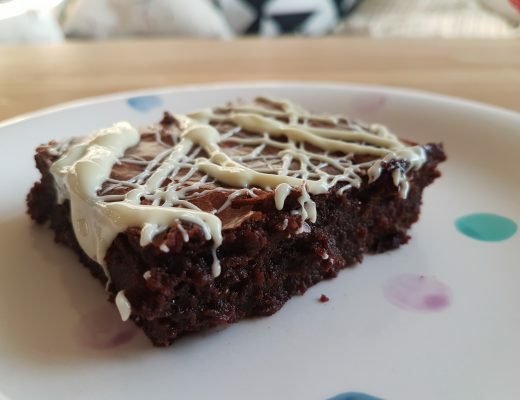 I love a traybake – it minimises washing up time and cooks itself while you go off and do other things. 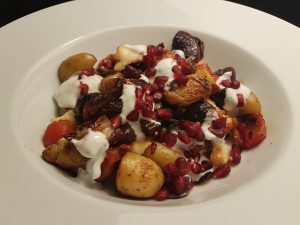 This particular recipe if finished off with the fruity pop of pomegranate seeds and a drizzle of minted, garlic, lemony yoghurt. Also, any leftovers make for a brilliant lunch at work the next day – pop some fresh salad leaves and crisp cucumber alongside the tray bake in your tupperware. Preheat the oven to 180C (fan) and prepare a large baking tray by drizzling it with the olive oil. 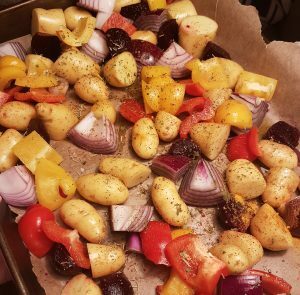 Now add the potatoes, peppers, red onion and beetroot to the tray. Sprinkle the paprika, mixed herbs, tumeric and salt and pepper over the veggies. Give everything a good mix around with a spatula and then pop the tray into the over to roast for 45 minutes. Give everything a stir midway through cooking. 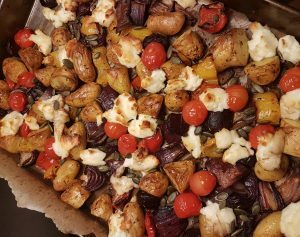 After 45 minutes, remove the tray from the oven, drizzle the balsamic vinegar over the veggies and add the cherry tomatoes and halloumi. The tray then goes back in the over for a further 10 minutes. Sprinkle the pumpkin seeds over the traybake, turn the oven up to 200C (fan) and cook everything for a final 5 minutes. Now you can quickly whip up the yoghurt dressing. Add the mint, yoghurt, minced garlic clove and lemon juice to a bowl and stir until well combined. Easy! This can now sit aside until the tray bake is ready. Remove the tray bake from the oven. The halloumi should be nicely browned on the edges and the veggies will be soft and tasty. Serve in large bowls, in generous portions. 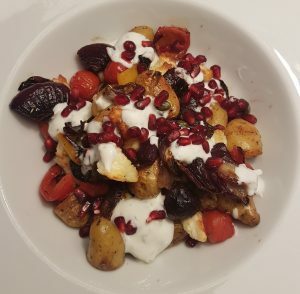 Drizzle the yoghurt dressing all over the veggies and them sprinkle with pomegranate seeds to finish. Enjoy! 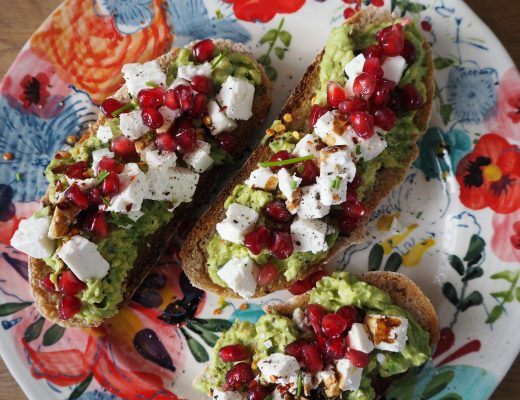 If you want to stretch this meal out for four people, serve with some gluten free sausages or with a big green salad with avocados and tasty leaves. 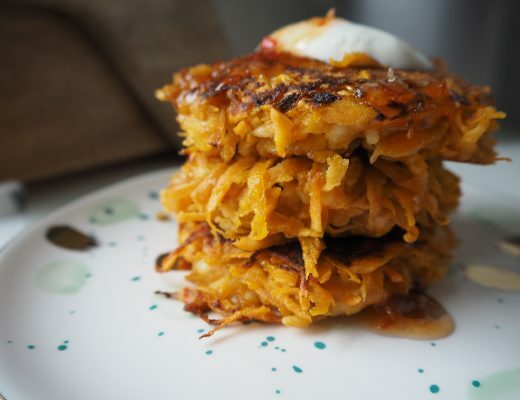 You can also bulk it out by increasing the amount of potato used or adding sweet potato for some variation.